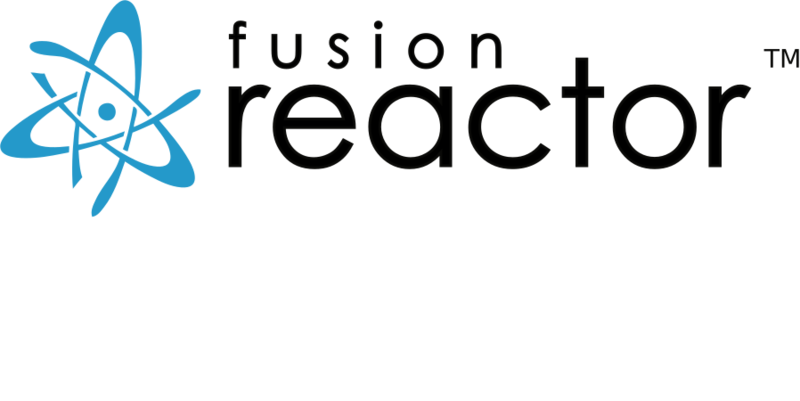 There’s a heck of lot to FusionReactor but in this article I’m going to focus on just one particular aspect - errors. Luckily, I’m a born error creator. One of the best. 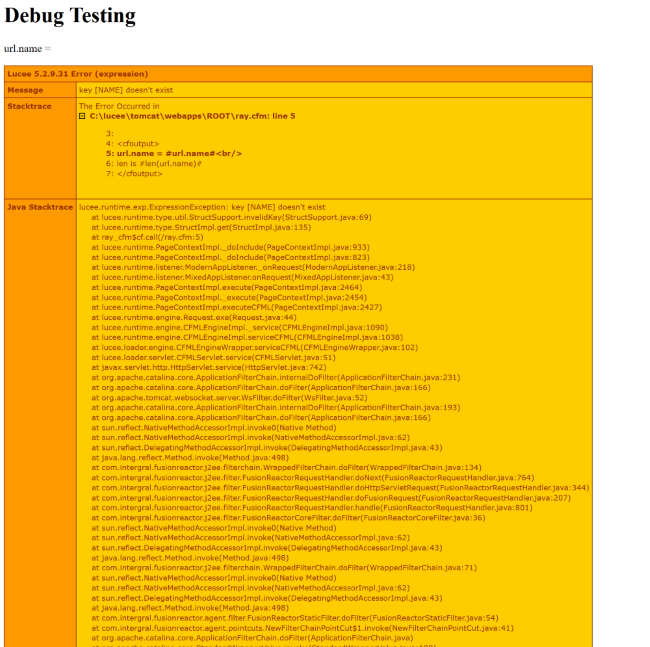 I should probably get endorsed on LinkedIn for writing buggy code. Thankfully that’s made me something of an expert in debugging a file and figuring out what went wrong. That’s rather easy while I’m writing and testing code. It isn’t necessarily helpful when the code is in production and being used by the public. Ok, astute readers will recognize the issue with this code. 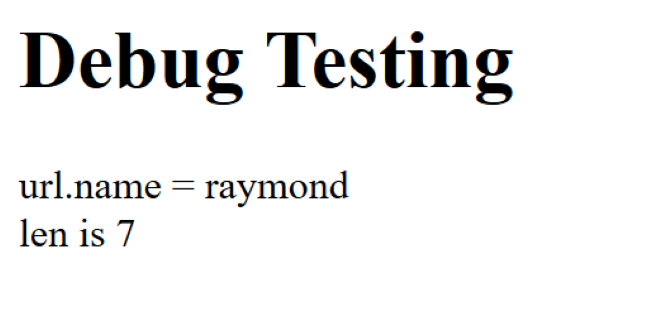 What happens when you don’t pass the name value in the query string? "Hey, the web site is broke." 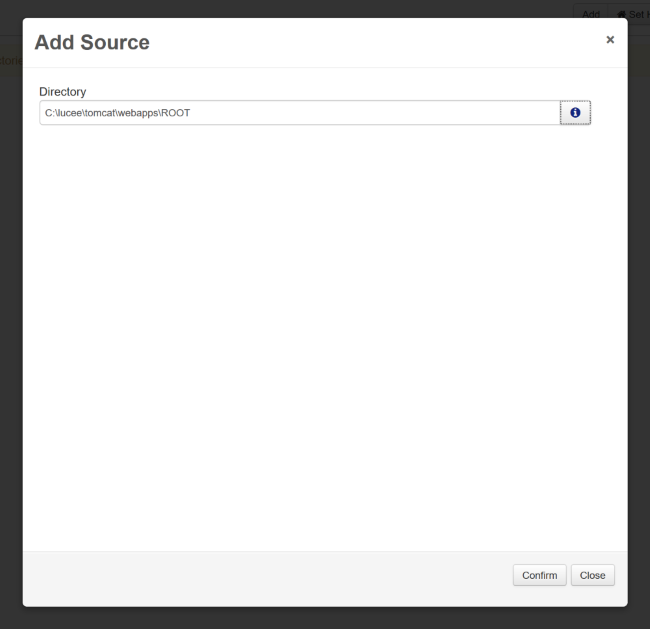 Status Code: When a request is made over the web, a server returns a code that represents how it was handled. 200 represents a good response. 500 is a bad response. 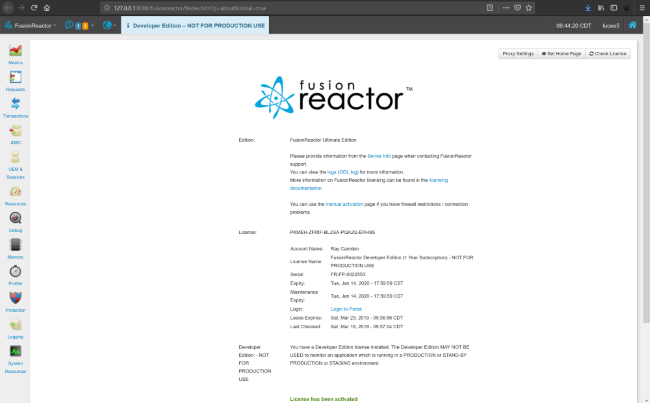 (And note how FusionReactor is flagging that already!) There’s a great many different status codes out there and you should take a look at them sometime. URL: This tells you the URL of the request and normally, but not always, will give you an idea of the file that was requested. 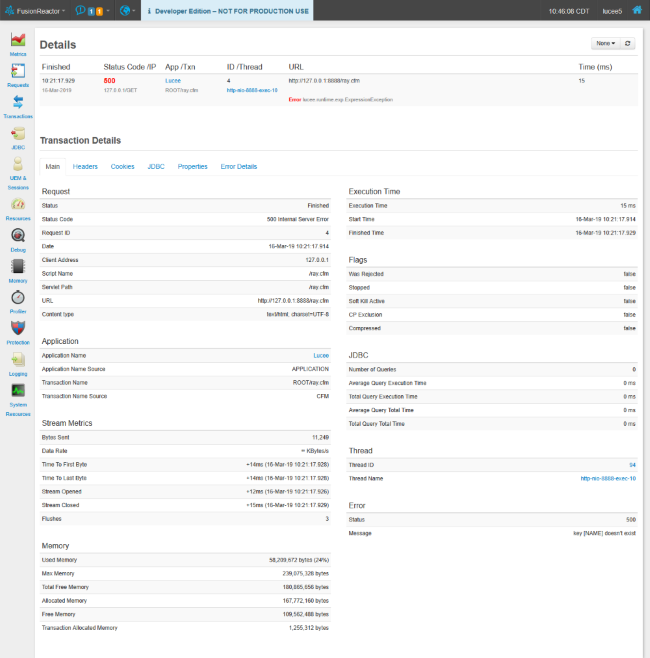 Many people will use URL Rewriting to “hide” the fact that ColdFusion is running. In this case it’s pretty obvious: http://127.0.0.1:8888/ray.cfm. Given that the URL path is /ray.cfm I can figure out that it’s the ray.cfm in my web root. But you can’t always count on it being that easy. 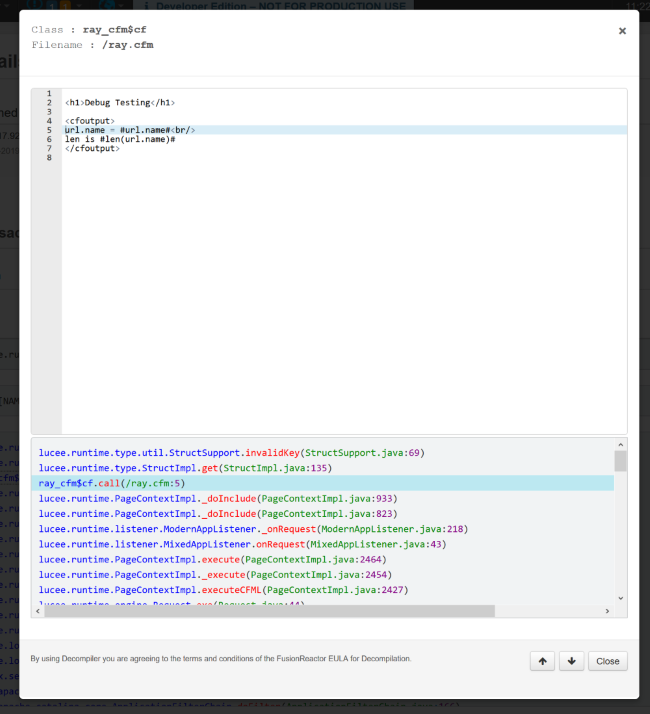 Also note that the error in this view is Java-related: lucee.runtime.exp.ExpressionException. Don’t worry - we’re going to dig into this. The first two blocks give you a good idea of what’s going on. key [NAME] doesn't exist is a clue that your code tried to use a variable that didn’t exist. If the key aspect doesn’t make sense, it may be helpful to remember that ColdFusion variables are scopes, or structs, and when you access url.something, you’re trying to use a particular key in that scope. 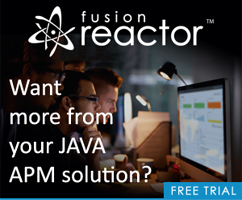 Now if you click on the method call, which is ray_cfm$cf.call, FusionReactor will actually be able to show you the file itself!